Faced with students demonstrating in the streets of Spain’s principal cities and widespread opposition in Congress, acting-Prime Minister Mariano Rajoy of the conservative Partido Popular on Wednesday pledged what may be one of his first political compromises if re-elected Saturday, saying he will postpone controversial re-validation testing (reválidas) of secondary (ESO) and high-school (bachillerato) students until a consensus alternative is reached with opposition political parties. The federal reválidas testing of students in addition to their having earned primary, secondary or high-school diplomas granted by their regional education systems is a key part of the controversial 2013 LOMCE education law passed by the PP majority in Congress over opposition objections during Rajoy’s first term in office. 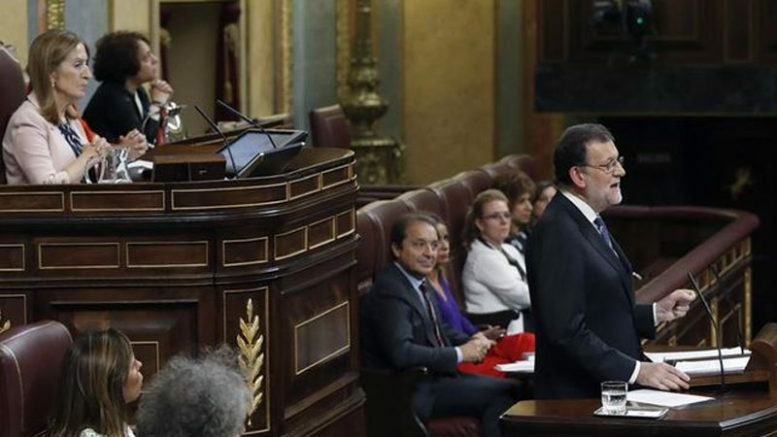 On Wednesday, during Rajoy’s opening address of the debate process that will lead to a Congressional vote Saturday on whether he will lead Spain’s next government, the acting-prime minister said that if re-elected he would not agree to the rescision of the entire LOMCE law, but would postpone the controversial reválidas for a period of six months until consensus can be reached with the opposition Socialist party and others in Congress on how to address the testing issue. The pledge from Rajoy came as hundreds of thousands of ESO and bachillerato students, teachers and parents took to the streets Wednesday in Madrid, Barcelona and other major cities across Spain to denounce the LOMCE law and, in particular, the reválidas testing as an unnecessary and burdonesome intromission of the federal government in the educational systems administered by regional governments across Spain.